Kebab restaurants are a popular stopping place for people on the way home from the pub, and this style of food can be adapted really easily to make a delicious and healthy meal. The traditional style kebab is the doner, strips of lamb. Unfortunately, if you want to look after your health, shop bought kebabs are probably a treat that you should limit. A study of takeaway foods by Dr Tom Sanders, professor of nutrition at Kings College London, showed that from a sample of nine different takeaway meals, a doner kebab was by far the least healthy with more artery clogging trans fats than any other fast food he sampled. The doner was also high in saturated fat. So, when you fancy a kebab, what are the options if you want to try making your meal more healthy? Making a homemade version of a doner kebab is hard to do, as we don’t have access to the right kebab making equipment! This recipe makes use of healthier fresh lamb, rather than a huge block of meat that’s been sitting in a shop all day. It’s also served with plenty of vegetables which will make it healthier and a delicious tasty treat for kebab hungry families. Make a marinade by mixing the garlic, oil, wine, and spices in a large bowl until well combined, then add the meat to the mixture.Chop the courgette into thick slices and add them to the marinade mixture with the baby button mushrooms and pepper pieces. Cover the bowl and leave the ingredients for an hour. When the ingredients have been marinated for an hour, take them out of the bowl but keep the remaining marinade. Thread the meat onto skewers with the other ingredients starting and ending with the lamb pieces. 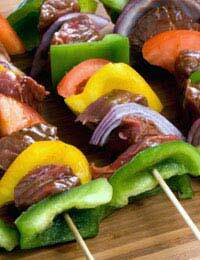 Grill or barbecue the kebabs for fifteen minutes, turning regularly and basting with the marinade. Then serve then in warmed pitta bread with plenty of leafy salad for a scrumptious and much more healthy kebab. The side dishes you find at a kebab shop can be just as much of a treat as the main courses. The scrumptious potatoes that you get from the kebab shops (not the chips) are easy to make at home and much better for you if you make them yourself. A moreish treat to go with your healthy kebab. Add the oil and spices to the bowl and mix well. Season with salt and pepper. Chop the potatoes into chunks, and add to a pan of boiling water. Cook for about ten minutes, take them out of the pan and drain. Shake the pan to fluff up the edges of the potatoes and leave them to dry on some kitchen roll. When the potatoes have dried, add them to the oil mixture, coat them well and place on a baking tray in a preheated oven at gas mark 8 – 220 degrees. Bake the potatoes for ten minutes, then take out of the oven and turn with a spatula. Drizzle with the remaining oil mixture and cook for another twenty minutes or until the outside is crispy and the inside fluffy.